What sweeter feeling is there than to be a witness of a couple's love? 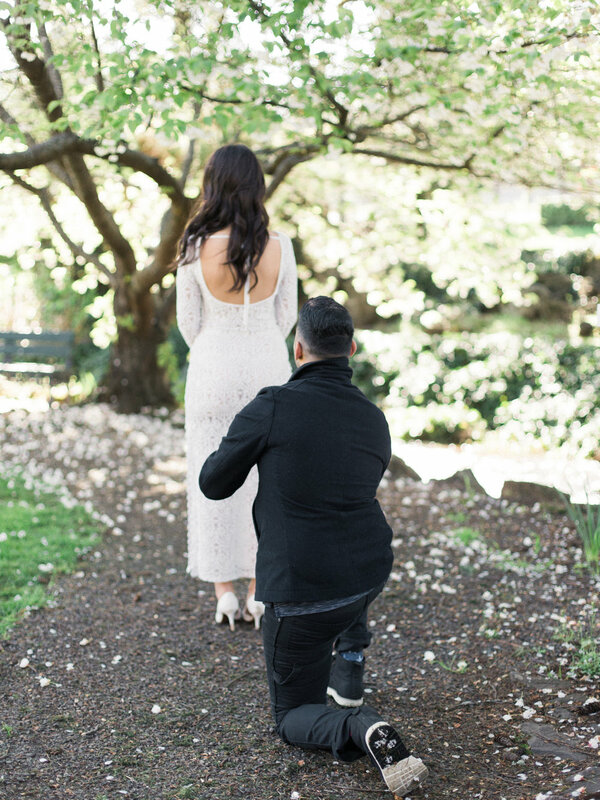 When Pierre asked me to document his proposal, I had to really contain my excitement! Having worked with him and Jacqline before, it was an honor I didn't take lightly. Their love and energy is truly radiant and unique, and being able to serve as a photographer and artist for these moments is what I really live for. A few weeks before the proposal, I asked Jacqline to take part in a wedding shoot at the Columbia Gorge Hotel. She graciously agreed, and we began planning what we thought would be a quick bridal session. About two days before the session was going to take place, I received a call from Pierre, Jacqline's boyfriend and life partner. Nervously, he told me he bought a ring for Jacqline and wanted to ask her for her hand in marriage. I tried to hold back my excitement as I said I would check on a few details before I could agree. A few minutes later, I messaged him back giving him the green light. I asked Jacqline to pose underneath a gorgeous blossoming tree as I wanted to capture some of the details around her. As I pretended to snap away, Pierre slowly walked up behind her, got down on one knee, and staged his proposal. Jacqline was clearly surprised, obviously said yes, and the whole team felt a wave of success (for keeping it a secret), and a overwhelming rush of happiness for the soon to be Mr. & Mrs.
From the bottom of my heart, congratulations Pierre & Jacqline. Here is to many years of good surprises! Dear Katie: How Can I Become A Professional Photographer?